Dinner, Art, and a TV Show? | Dream! Go! Live! 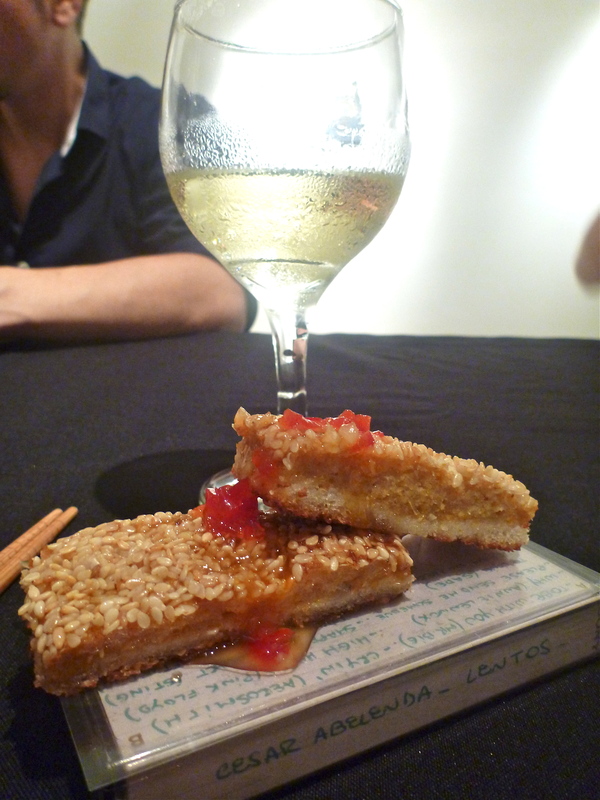 There are dozens of puerta cerrada (closed-door) restaurants in Buenos Aires and in the last four weeks I tried two Asian ones, Cocina Sunae and Casa Mun with mixed feelings and results. On Friday I went to my third such “underground” dinner at Max’s Supper Club at the recommendation of a fellow blogger, Franco (thanks!). I found Max’s Supper Club page on facebook and saw that for the next event, he was creating a dinner inspired by the works of Carmelo Arden Quin and the Madí movement. 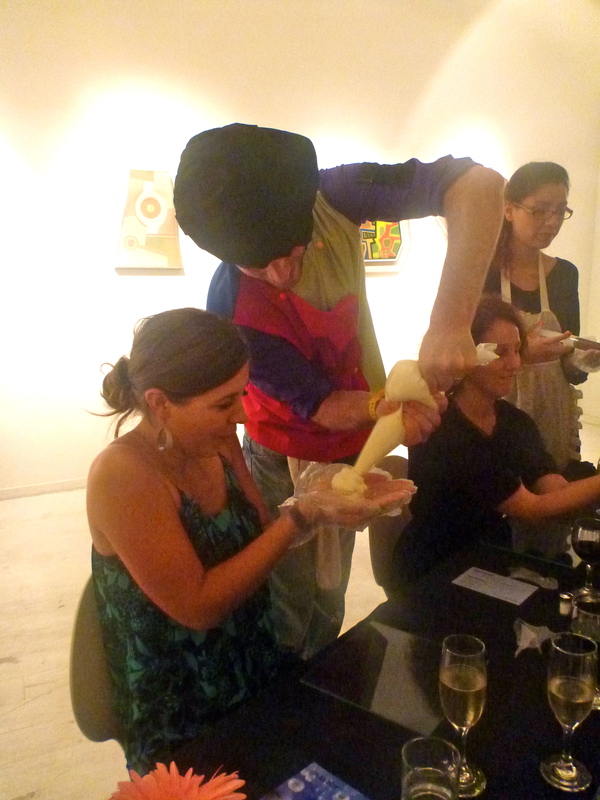 Unlike other closed-door restaurants in Buenos Aires Max’s Supper Club works like a pop-up, where Chef Max changes the venue and the theme of his food based on various works of art. 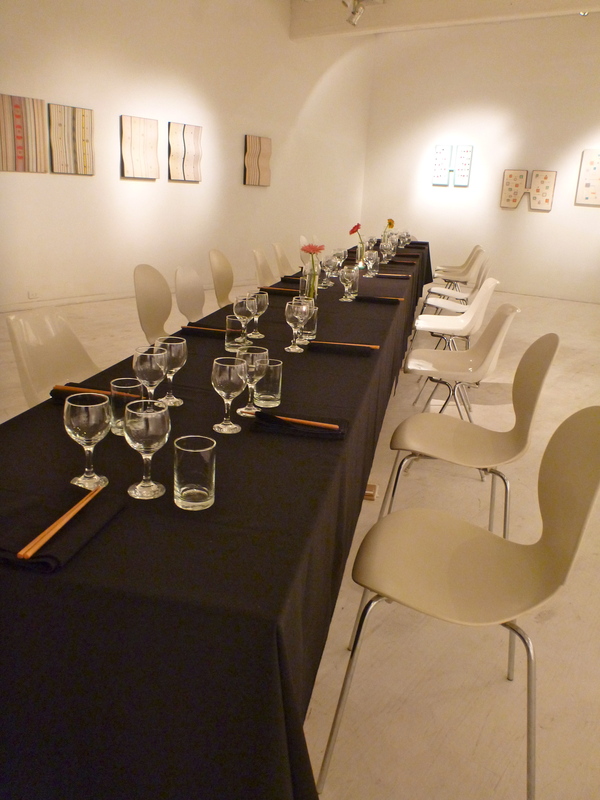 I loved this idea and the fact that this dinner was going to be held at a contemporary art gallery in Palermo where I live. I knew I had to check it out even if it meant going alone; I would have art, food, and Argentine wine to keep me company! Chef Max and I nearly had a chance meeting at Tegui (we sat next to each other at dinner one night without realizing), but ended up corresponding via e-mail until a last minute cancellation allowed me to join the dinner organized for last Friday, February 17, 2012. I arrived at the Galería Braga Menedez at 9PM for the champagne reception meet the other diners and mingle. 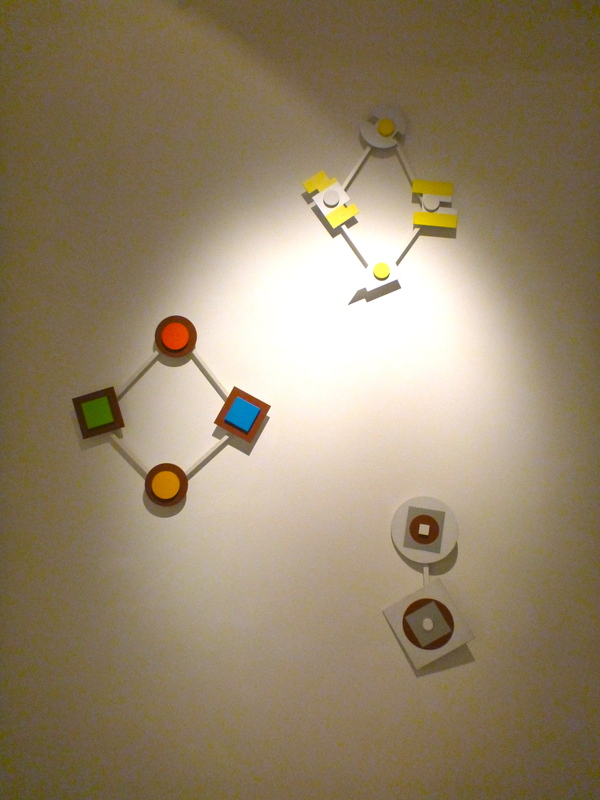 It gave me a chance to walk around the gallery to see the inspiration for the evening and say hello to the other guests. A few were foreigners like me (including a British woman who recognized me from yoga class) but I was really happy to see that there were more native Porteños this evening than foreigners. It was a big contrast to my dinner at Casa Mun where 99% of the guests were foreigners and Spanish was not spoken at all. And another big different this evening was a camera crew filming for the TV show, Globe Trekkers, which was bit of a surprise. The presenter for the program, Judith, was dining with us and she was one of the first people I met when I arrived. She was an engaging, down-to-earth, fun young woman who was bilingual (Paraguay->London->New York->LA), with an easygoing personality that made the presence of cameras and lighting equipment almost unnoticeable. 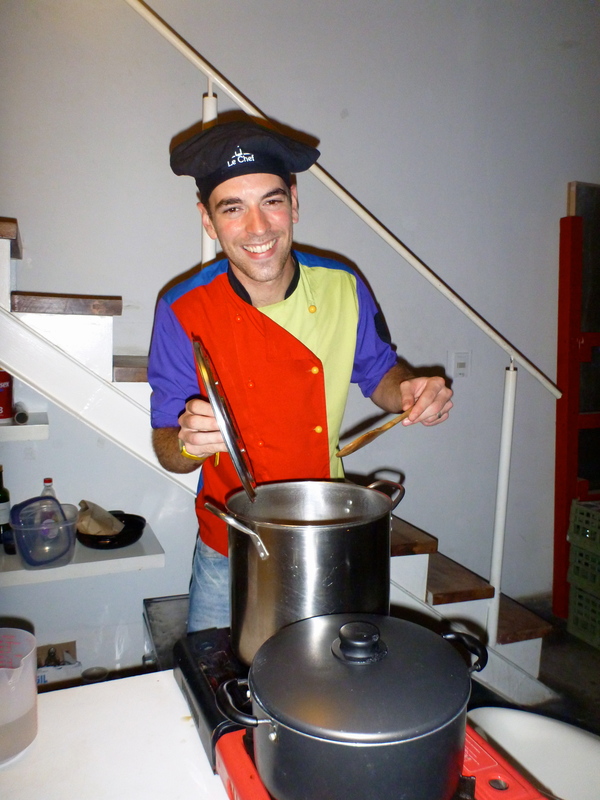 Chef Max could be seen stirring a large pot and putting finishing touches over a make-shift kitchen by the front lobby of the gallery, while giving interviews and posing for photos. We sat down for our first course, which Chef Max explained first in English and then in Spanish, as shrimp toast from his days in London. It was paired with Serbal Viognier 2011 from the Uco Valley; I really liked this vibrant wine and the sesame crusted shrimp toast together. The crispy savory little morsels were not too crunchy, not too soft, not too greasy, and not too dry. They were served on cassette tapes; mine was a mixed tape made by Cesar, entitled “Lentos” with some tracks from Annie Lennox, Mr. Big, Sting, and probably two songs too many from Aerosmith. We all had a good laugh looking at everyone’s plates (cassette tapes) as we enjoyed our starter. The second course was salmon three ways, paired with Urraca Chardonnay 2009 from the Alto Agrelo area of Mendoza, in Luján de Cuyo. It was served on a plate of glass. 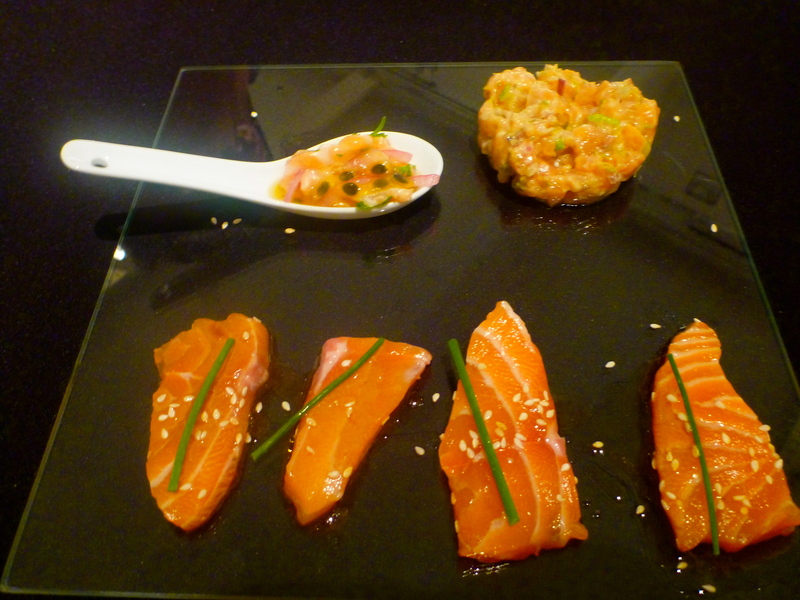 Of the three my favorite was the salmon ceviche with passion fruit, followed by the salmon tartar which had a nice bite from peppercorns. The AC in the gallery had broken down during the day and the repair attempts were not successful, making the space more than a bit stuffy. We popped outside in between courses to get some fresh air and it was nice to speak to some of the other guests who were not sitting near me. Back inside, we continued our meal with a hot butternut squash soup with white truffle oil, served in small Coca-Cola bottles. I was seated next to a Porteña who happened to be a restaurant critic and food writer for the local paper Clarín. She told me she was working on a story about pop-up restaurants. In between bites, I sneaked in some questions about her favorite places to eat in Buenos Aires. Needless to say, my list grew very long by the end of the evening. I always think of butternut squash as a winter vegetable. And in this unusually warm room in the middle of summer in Buenos Aires, I had a tough time really savoring the creamy hot soup, however delicious it was. Chef Max explained that he cooked his favorite dishes for dinner; I couldn’t help but wish he’d favored a chilled Vichyssoise instead. This course was paired with Catalpa Merlot 2009 from Bodega Atamisque. 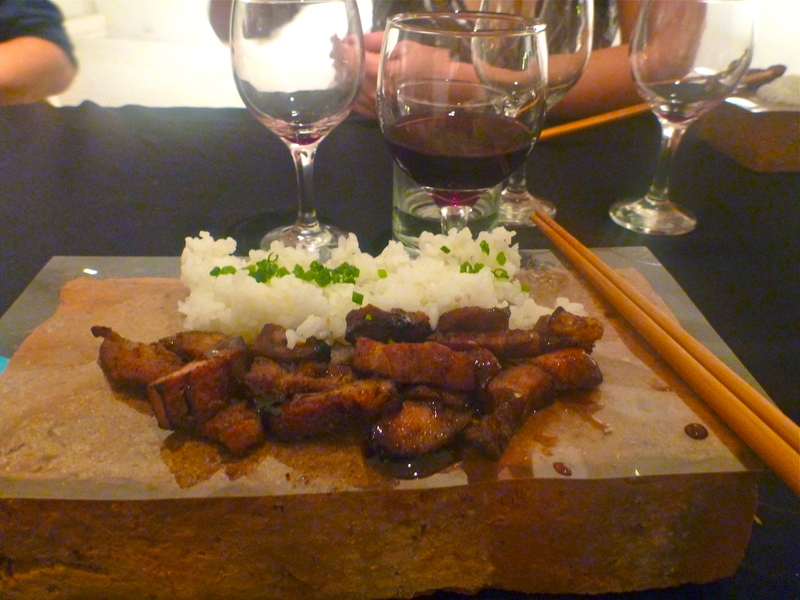 Our plato principal, main course, was char-siu pork with steamed rice served on a large brick. It was a bit sweet for my taste but well balanced with the Ave Malbec 2010. I had no idea what Chef Max was serving for dinner Friday evening but I found it interesting that his cooking had such a strong Asian influence (or that he enjoys Asian food so much). I absolutely loved the interactive and delectable last course. 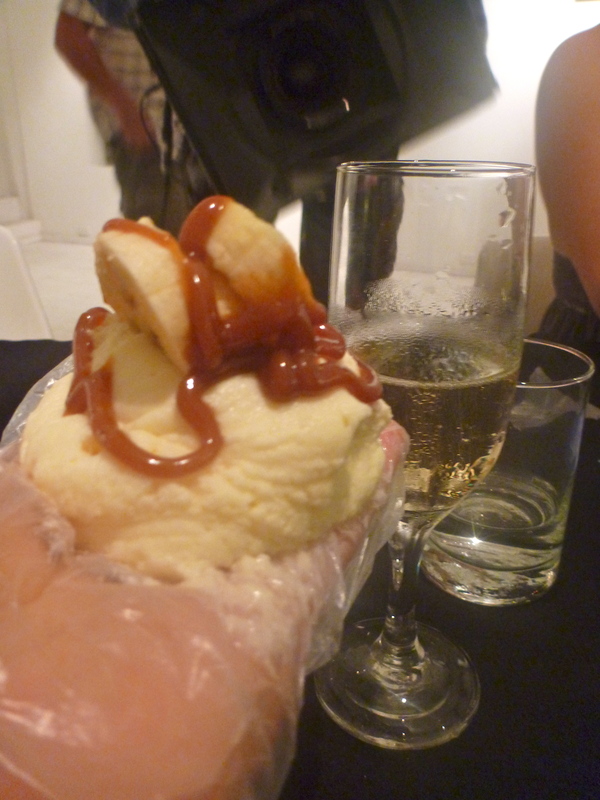 It was a deconstructed cheesecake with bananas and dulce de leche. We were asked to put on plastic gloves, which made our hands and fingers (the original plate and utensil) the ultimate vehicle for our dessert. Chef Max came around with a piping bag full of cheesecake filling, his friend and assistant Gonzi put some banana slices on top, and Ana (Chef Max’s girlfriend and mesera) provided the dulce de leche from a large syringe. With another glass of champagne to finish our meal we headed upstairs at the urging of Flor, the owner of the gallery. 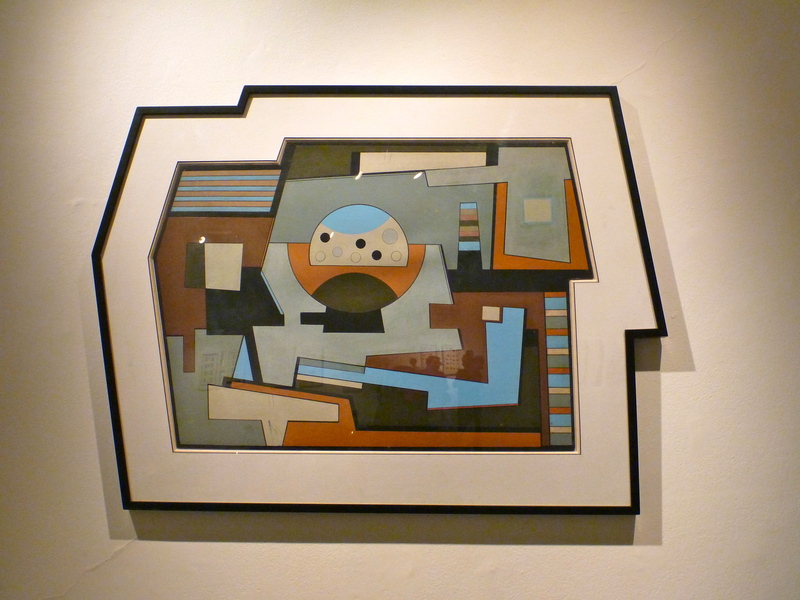 There we got to walk around and see up close some very cool modern works of art by local Argentine artists, including Gato Secretaire by Edgardo Giménez. 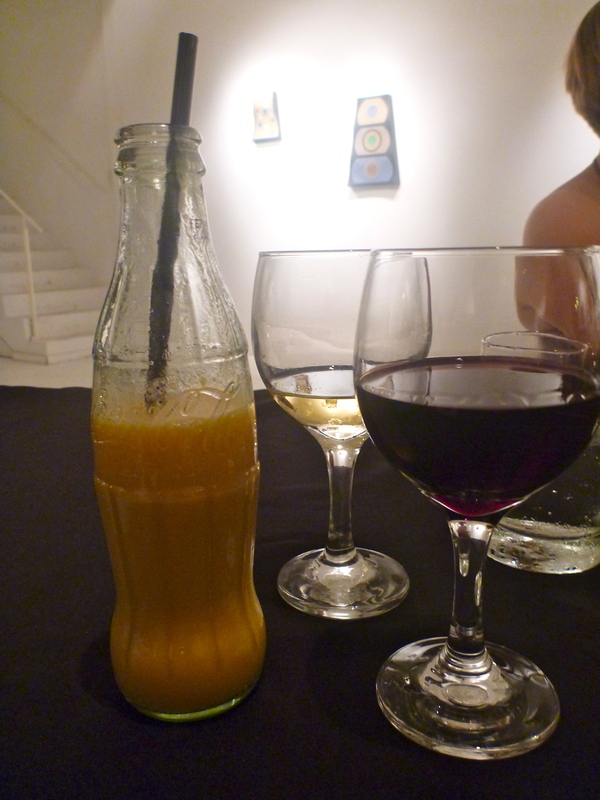 This was by far the best puerta cerrada experience I’ve had in Buenos Aires. There was a festive dinner party atmosphere with interesting guests, wonderful modern art, nicely matched by a young chef whose infectious enthusiasm made everything taste better and more fun. Chef Max’s dinner Friday night, with his creative interpretation of traditional serving plates and vessels, certainly qualified as a work of culinary art in the vain of the Madí movement. 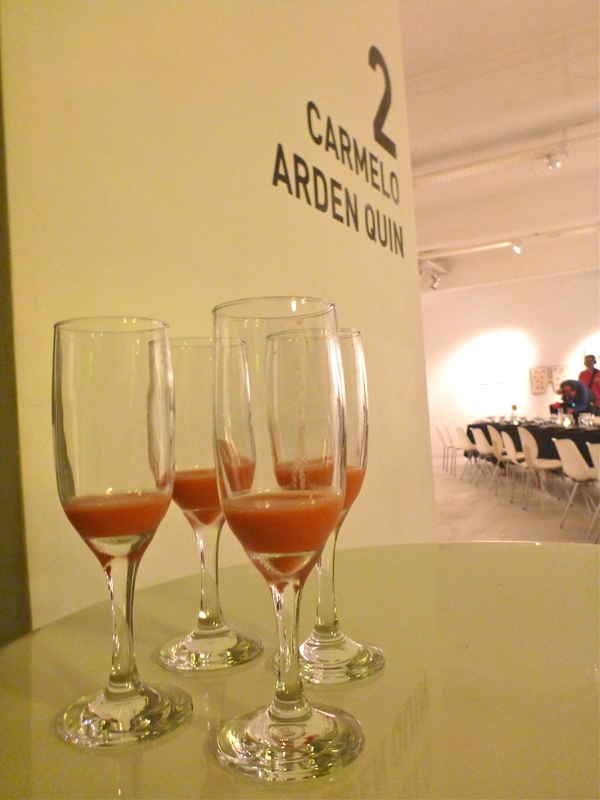 This entry was posted in 2012, Argentina, Travel and tagged Argentine Wine, Buenos Aires, Carmelo Arden Quin, Closed-door Restaurant, Contemporary Art, Dining in Argentina, Dinner, Dinner Party, Fine Art, Global Cuisine, Globe Trekker, International Cuisine, Madí Art Movement, Palermo Hollywood, Pop-up Restaurant, Puerta Cerrada, Solo Dining. Bookmark the permalink. 3 Responses to Dinner, Art, and a TV Show? I just read this now! I’m so happy you had a good time. It was really fun. Thank you so much for telling me about Max!